If you abridge a book or play you make it shorter by making cuts to the original. An adjunct is something or someone that is added to or joined to something that is larger or more important. Something that happens unexpectedly and by chance that is not inherent or natural to a given item or situation is adventitious, such as a root appearing in an unusual place on a plant. When something is ancillary to something else it means it supports it but is less important than that which it supports. An appurtenance is a supporting feature, form of equipment, or item associated with a particular activity. Attrition is the process of gradually decreasing the strength of someone (such as an enemy) by continually attacking it. A cardinal rule or quality is one that is considered to be the most important or basic in a set of rules. Something is concomitant when it happens at the same time as something else and is connected with it in some fashion. The crux of a problem or argument is the most important or difficult part of it which affects everything else. An entourage is a group of assistants, servants, and other people who tag along with an important person. Paraphernalia is the equipment that one uses to do something, or one’s personal belongings collected over a period of time. A soldier’s uniform generally includes several accoutrements or accessories in addition to the clothing itself: belt, weapon, communication device, etc. Originally a military term, the word accoutrement is now used to describe the extra gear of any specific activity or status. The accoutrements of wealth, for example, might include expensive cars or vacation homes; the accoutrements of a professional gymnast might involve a balance beam, the rings, chalk, and uniforms. Quiz: Try again! What is an accoutrement? Essential extras that belong to a specific activity or state. Something extra that you don’t need. A unique form of travel gear. Accoutrements are the things that you take with you when you travel or when you take part in a particular activity. A Scooter Mint Those who ride scooters swallow nasty-tasting bugs. So they need to pack "scooter mints" for every ride. An accoutrement is something that is specifically “sewn together towards or on behalf of” a particular activity that one does. 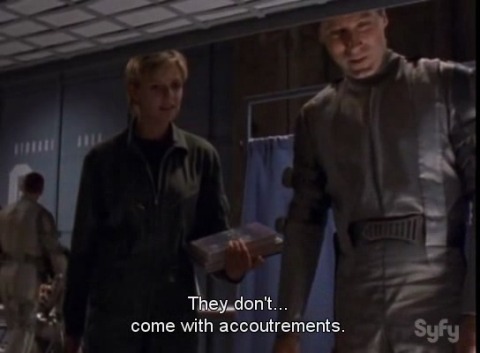 Stargate SG-1 The sleeping platforms don't need accoutrements since they adjust automatically to body temperature. accouterment n → spelling variant of "accoutrement"